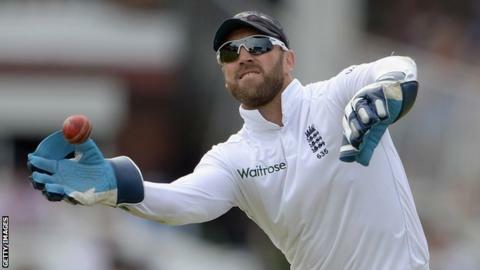 England wicketkeeper Matt Prior has co-founded the new professional One Pro Cycling team. The 32-year-old, who took a break from the England set-up in the summer to recover from injury, said cycling was a "huge passion" of his. One Pro Cycling aims to compete at UCI Continental level, two tiers below Team Sky. "It's a big challenge," said Prior. "We could potentially do something very special and that excites me." The 12-rider squad is led by Yanto Barker and features a number of riders who came through the British cycling ranks. "It's a dream come true," Prior told BBC Radio 5 live. "The important thing we want to do is create an environment for these riders that allows them to get the absolute best from themselves. "The professional cycling team is the exciting part but there is a lot more coming from One Pro Cycling in the future." Prior, who has played 79 Tests, was criticised by former England team-mate Kevin Pietersen when he took a bike on a tour of New Zealand. Pietersen wrote in his autobiography: "You don't need to take your bike with you. They have bikes in New Zealand. "Who the hell takes a bike? If Cheese (Prior) wasn't a top genius cricketer, Cheese would have been a world-class cyclist. Obviously."